My practice is based on the intricate precision and geometry behind structure and design. I began this practice trying to portray the detail and precision I incorporate, and value highly in my drawing and design work. Sculpture was an area of interest and I felt paper would be a suitable material to transition and experiment with these qualities. Using white paper allows lighting and shadows to take effect and provide a strong contrast, highlighting each angle and component of the form. 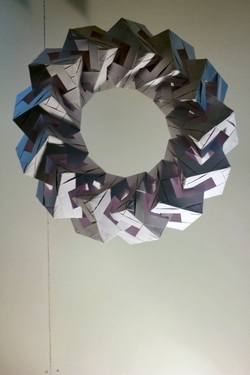 Paper allows a variety of shapes and models to be created using a multitude of techniques, and using origami I have been able to produce an extensive amount of geometrically accurate designs, with each individual form adding to the finished arrangement of the installation.